We retraced our route northwards via Aleppo and back into Turkey. The most straight forward route is via Adana from where you climb the Taurus Mountains towards Cappadoccia. It's a dramatic ascent and when combined with the narrow road and crazy truck drivers it's best done when you are fresh and wide awake. 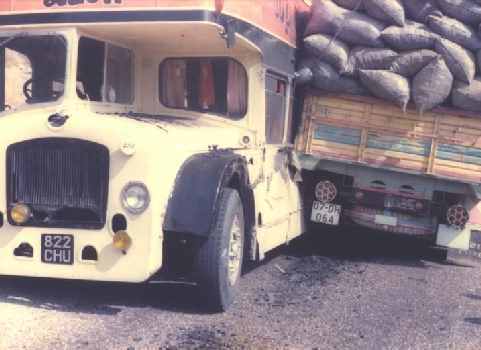 On my last Overland on a reversed itinerary we were heading down the road on a steep and narrow section when a heavily laden coal truck collided with us! Repaired, painted and ready to go! The unwritten rule of the road gives the descending driver right of way but on this occasion it was clear that both of us were not going to fit so we came to halt wheels overlapping the mountain-side. The truckie was never going to take the risk of going over the side and he kept to the centre ploughing straight into us. Poor old Belch's aluminium skin was ripped open and the mud-guard ripped off. 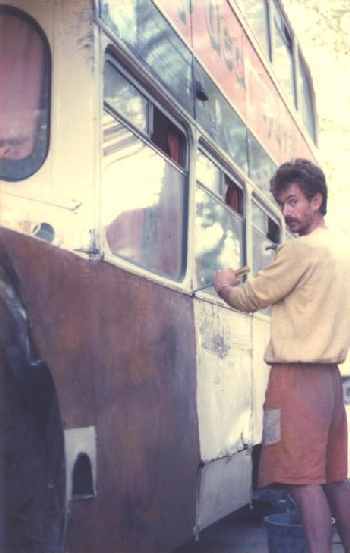 Bags of coal split open and its sooty grim filled the bus - we were wedged tightly together and it seemed that at any moment we would teeter over the edge. Prising the two vehicles looked difficult and as we argued over the merits of the best approach a monster traffic jam ensued. Like many things in eastern Turkey it was resolved at the barrel of a gun. A group of paramilitary types resolved the matter by insisting that the coal truck pull itself free. Against my advice Trevor stayed at the wheel and he cleverly manoeuvred the swaying bus away from the edge. Justice was later administered Turkish style with both drivers being fined for the bingle. Carrying out the repairs posed somewhat more of a problem. The whole trip was run on a shoestring and we were always given the minimum amount (or less) of money required and there were definitely no funds included for panel beating! We sourced a rusty piece of steel and had it cut to the right shape. 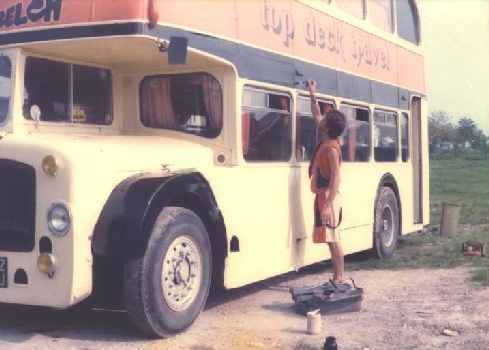 Next Trevor hand-drilled the steel so it could be fixed to the bus' frame. Any gaps or imperfections were liberally filled with bog and after painting see looked like new again. It is a big day's drive to Cappadocia but the effort is absolutely worth it. Take the road for Kayseri. We stayed a little further east at Ürgüp which is great spot from which to tour the sights of Cappadocia, especially Goreme. The underground cities of the region were all used by the Christians during the seventh century as places to escape persecution. These cities included rooms for grain storage, stables, living rooms, kitchens and air shafts. From here you heat north east to rejoin the main trans-continental highway at Sivas. You then take this road via Erzincan, Erzurum, Ağri and Doğubayazıt to the Iranian border. This is a noticeably wilder region and the police and military are much in evidence with regular roadblocks punctuating the journey. We adopted a policy of keeping the soldiers and police from coming on board. The roadblocks were targeting the Kurdish minority but we provided a diversion for them plus the opportunity to extract a little baksheesh. At one stop they were very insistent about searching the vehicle but I stood my ground and poked my finger down the barrel of the soldier's rifle to express my opposition. 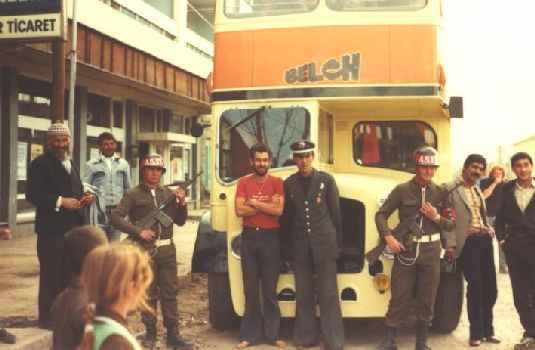 We struck a compromise and the bus was searched but the weapons left outside. After the obligatory exchange of Marlboro Reds we were on our way again. Of course the big scenic highlight of this stretch is Mt Ararat where Noah's Ark supposedly came to rest after the big flood of the Old Testament. At Doğubayazıt (we called it 'Doggy-Biscuits') we searched in vain for beer somewhat unsuccessfully. We bought a vile concoction very much like Nepalese Chang for an evening's celebration before entering Iran. On most trips we free-camped just before the border, something that most people wisely advise against. On one trip both Trevor and myself took advantage of the town for a haircut - we both emerged shorn like new recruits in the Turkish army. The customs on the Turkish side was straightforward with the Iranians providing the only delays.